This year (2012), more than 100,000 triathletes will compete in 37 Ironman events across the globe, many of them hoping to earn one of an estimated 2,150 coveted Ironman Kona Triathlon World Championship Slots. 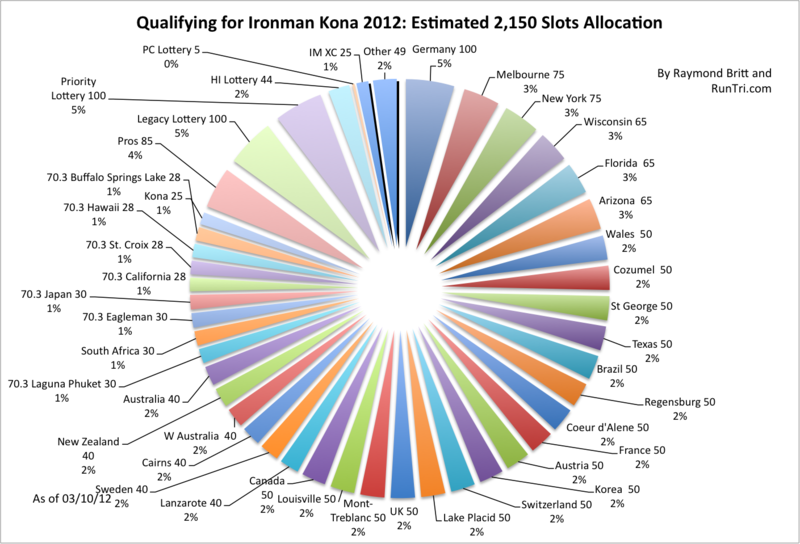 Qualify for Kona (or win the lottery) and you earn the right to race with the best triathletes in the world. We've conducted extensive research to assemble what is perhaps the only comprehensive listing of estimated Kona qualifying slots on the web. Want to go to Kona? Here's where you want to start. 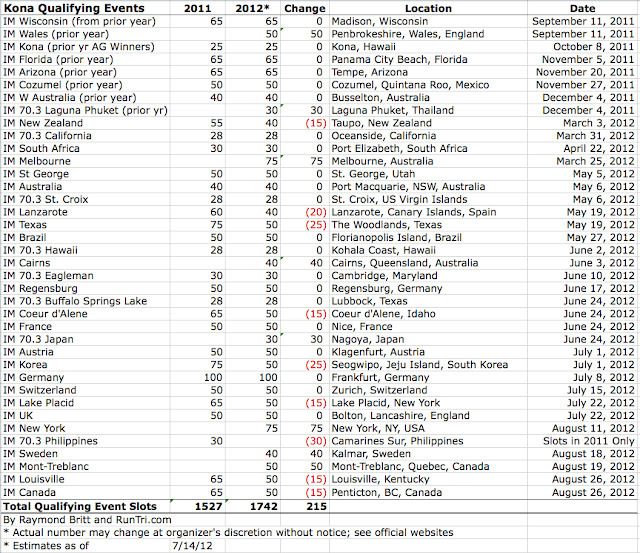 Be aware that WTC, owner of Ironman, often adds new events with additional slots (e.g., Cairns, Sweden), and occasionally subtracts slots from existing races, sometimes without notice. If you are selected in the lottery, you must validate that entry by completing a WTC-owned Ironman or Ironman 70.3 event within an established timeframe. We have not come across information regarding a 2012 lottery process as of mid-August. Pro Division: 85 Slots. Beginning in 2011, pros earn Kona slots via a pro ranking system. Approximately 85 slots are expected to be awarded to pros this year. 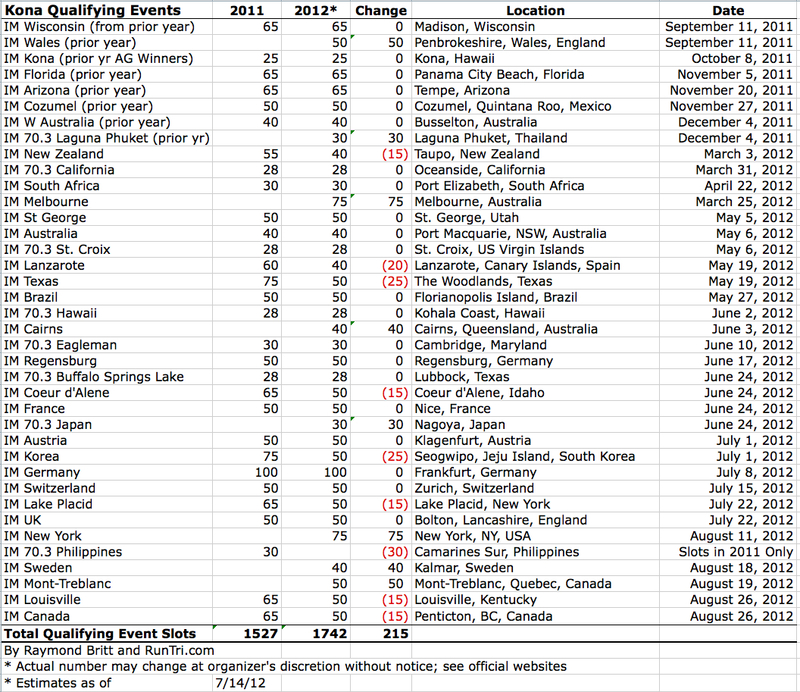 Additionally, pros who have won the Ironman World Championship within the previous 5 years are automatically granted entry. Ironman Executive Challenge (XC): 25 Slots. 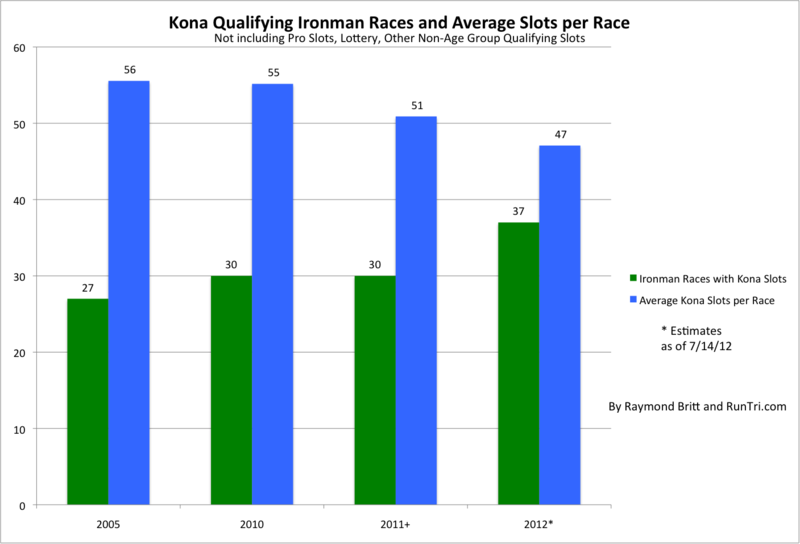 Select business executives (roughly 12 to 16 per race) compete with age groupers in one of several Ironman or Ironman 70.3 races for the chance of winning Kona slots specifically reserved for the executives. In the 2011 season, Ironman XC included Ironman events in Arizona, Coeur d'Alene, Florida, Germany, and Louisville (typically 3 or 4 slots per race), and Ironman 70.3 events in California, Mallorca, New Orleans and Switzerland (1 slot per Ironman 70.3 event). Other: 49 slots. Last, add around 49 -- a very rough guess -- slots distributed to NBC (for feature human interest stories), sponsors, a celebrity or two (IndyCar racers Tony Kanaan and Vitor Meira, e.g. ), and an extra lucky VIP or two. It may happen that some athletes will choose to not accept a slot they earned for some reason; any slots not accepted ‘roll down’ to the next finisher(s) who also have the option to accept or pass on the slot. See official race rules for details and timing. It's very important to know who, where, when and how much, if you've qualified or have a shot at a rolldown. Visit ironman.com and ironmanworldchampionship.com for any and all official information regarding qualifying for Kona.